One of the most important assumptions underpinning the Buddhist project, which moreover shaped Buddhism’s historical interaction with other religions and the cultures into which it migrated, is the belief that the gods are ignorant beings still trapped in saṃsāra, while the Buddha and other Buddhist figures (arhats, pratyekabuddhas and bodhisattvas) are wise and liberated from saṃsāra. Buddhism is historically unique as a revealed religion in that it does not deny the existence of non-Buddhist deities, nor does it demonize them. This stands in contrast to Christian thought, in which the gods of polytheists are at best intellectual errors, or at worst spawns of Satan intent on leading away souls from God’s salvation into Hell. Buddhist traditions throughout history have believed that gods do exist, and they might even be helpful at times, but they are not a means to liberation from saṃsāra. This is why cults to local gods have normally been retained in Buddhist cultures. However, these same Buddhist traditions also tend to consciously reduce the status of local pantheons. This reason behind this is traced back to the myth of the genesis of Buddhadharma. As the ancient account of Śākyamuni tells us, the young prince decided to abandon his family to pursue a spiritual quest, realizing that worldly pleasures are fleeting, and that liberation from saṃsāra was the only reasonable goal to pursue in life. After studying under some teachers and experimenting with their teachings, he eventually figured out the full truth, unlike his past teachers, and became a fully-awakened buddha, i.e., an awoken one under what would become known as the Bodhi Tree. He was initially hesitant to teach his Dharma to the world, but Brahmā requested that he teach, and it was only then that the Buddha commenced his teaching career (see here). There is, however, an issue with this myth: Brahmā is supposed to live millions upon millions of human years as a semi-omniscient god, high above even Mt. Meru, being able to look down and survey the world below at will. Why was a thirty-five year-old man able to attain full wisdom only after a few years, whereas Brahmā despite his immeasurably long life was never able to figure things out on his own? From a modern scholarly perspective, the introduction of Brahmā into the story of Śākyamuni’s awakening probably just reflects the attempt of early Buddhist bards to position their religion above those contemporaries who believed Brahmā to be the supreme god. This myth, however, points to the Buddhist assumption that the gods are ignorant or at the very least incapable of figuring things out on their own despite their status and lifespan, and that the buddhas know better. This is really important to bear in mind because this belief undermines the legitimacy of sacrifices performed to gods. The criticism of the efficacy of these sacrifices is one of the classical “selling points” of Buddhism: make your offerings instead to arhats and the sangha, since the merit is better. This also positions human sages, including those in the flesh and blood, above divine beings. A living arhat is considered a suitable refuge, whereas Brahmā is not. Even today, a Buddhist adept considered by his (or rarely her) devotees to be an arhat or advanced bodhisattva is indirectly also believed to be superior in wisdom to Brahmā. Brahmā is a largely ignorant saṃsāric god, while the living arhat, or tulku in the Tibetan context, is a wise being who has truly transcended saṃsāra. There are some traditional Buddhist explanations for the ignorance of the gods. One of the most common is that their realms are so pleasant that they have no need to think of suffering and the need for wisdom before their mortality starts to show, by which time it is too late to do anything. Even if exposed to the Dharma, they have no interest in it. This is why being reborn as a deva is almost as bad as being reborn as an animal: the former has no interest in Dharma, which is almost equivalent to being an animal unable to comprehend language. The gods might also hold false views and never relinquish them over the course of their long lifespans. However, Sakka or Indra was one of the few devas who decided to learn something from the Buddha (see Sakkapañha-sutta). This is remarkable because he is also supposed to be the king of the gods. The Buddha’s eminence is only elevated when he is served by this divine king. This again highlights my main point here: even the gods are better off serving the Buddhist cause, which indirectly constitutes a subtle suggestion that you ought to follow their example too. I’ve argued in the past that Buddhism ought to be considered under the umbrella of polytheism, since it clearly possesses a large pantheon. However, unlike most polytheist traditions (such as Hellenistic polytheism or Shintō), natural disasters and human tragedies in Buddhism are usually blamed on karma, rather than any conscious divine force. In Buddhist thought, there might indeed be some unseen being affecting you for better or worse, but ultimately you are supposed to consider hardship the fruit of past negative karma. In polytheist traditions, however, people are expected to offer sacrifices to specific gods as a way of averting catastrophes. You find elements of such polytheist practices in a lot of Buddhist traditions throughout history, although it isn’t necessarily a part of “orthodox” thought. The navagraha or nine planets in late literature are considered destructive demons (an originally Iranian concept!) that must be placated through recitation of dhāraṇīs and rituals, but more philosophical Buddhist works never address such matters, or how to determine when it is your past karma or a demonic force that’s bothering you. Another point worth considering is that polytheist traditions almost always think of humans as beneath the gods. There might be a select number of demigods on Earth, but they’re exceptional and probably already gone (Hercules comes to mind). You can perhaps gain a glimpse of divine workings and intentions through mystic visions or divination, but ultimately you as a human can never fully know or comprehend the gods. In contrast, in Mahāyāna Buddhism, you are expressly promised that you can achieve the same state as the Buddha if you practice accordingly, just as Śākyamuni did over the course of many lifetimes (and if you reach this goal, you will be above all mundane gods). Even before your attainment of buddhahood, you will become an advanced bodhisattva that stands above Brahmā and Indra. Again, this underlying belief legitimizes even modern worship of eminent monks and Tibetan tulkus who are believed by their devotees to be such advanced beings in flesh and blood form. I would venture to suggest here that part of the reason why Buddhism has been so successful in the West might actually be because of the belief that humanity can and ought to be superior to the gods. This is perhaps related to the widespread belief that humanity can and ought to gain superiority over nature (in ancient terms, this would have been conceived of as humanity gaining superiority over the gods). In the post-Christian world of the modern secularized West, God is long dead. Any tradition of Buddhism can be adopted and sanitized of gods, since these gods are arguably unimportant to the project of bodhi or awakening. A modern Buddhist is justified in completely dismissing practices of venerating gods and focusing exclusively on Buddhist doctrine and meditation, which is something scripture would only support. I think this isn’t even limited to the West. Modern times have seen a shift in Chinese Buddhist attitudes toward their traditional gods. 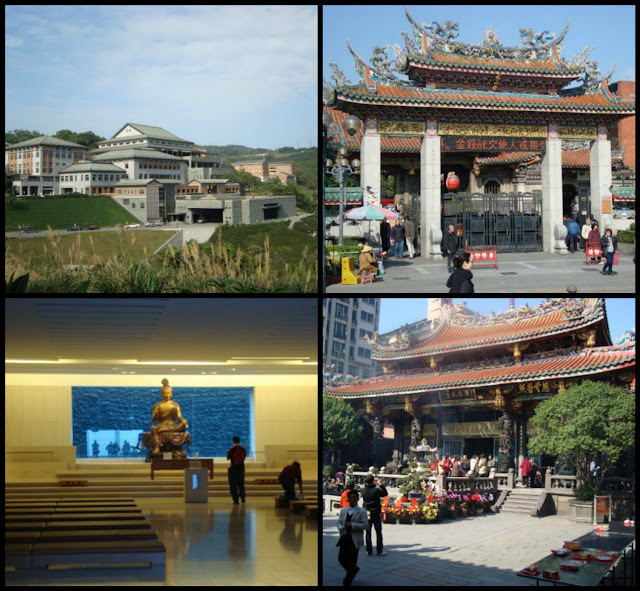 As a prime example, Humanistic Buddhism in Taiwan consciously purged their versions of Chinese Buddhism of what they refer to as heterodox (Chn. waidao 外道) elements, which includes both traditionally Buddhist and non-Buddhist gods. Although I have not seen any literature expressly denying the existence of said gods, their decisions when it comes to architectural planning reveal a sort of “Protestant” approach to physical icons. Dharma Drum Mountain 法鼓山 and Foguang Shan 佛光山, for instance, generally seem to avoid decorating their temples with statues of anything but buddhas, bodhisattvas, arhats and eminent Chinese Buddhist figures (such as Bodhidharma), whereas Longshan-si 龍山寺 in downtown Taipei, a much more traditional Chinese temple, brings together Buddhist and Daoist figures in one location that is furthermore decorated with dragons and other creatures. Things are somewhat different in Esoteric or Vajrayāna traditions, in which there is more of a positive appreciation of mundane gods, who generally have their place in major maṇḍalas. Mundane gods might also be "tamed" or otherwise subjugated and pressed into service for the benefit of Buddhism. This is why we see Vināyaka/Gaṇapati (Gaṇeśa) in the *Garbhadhātu-maṇḍala 胎藏界曼荼羅 in the outer court among other mundane deities (highlighted in yellow below). 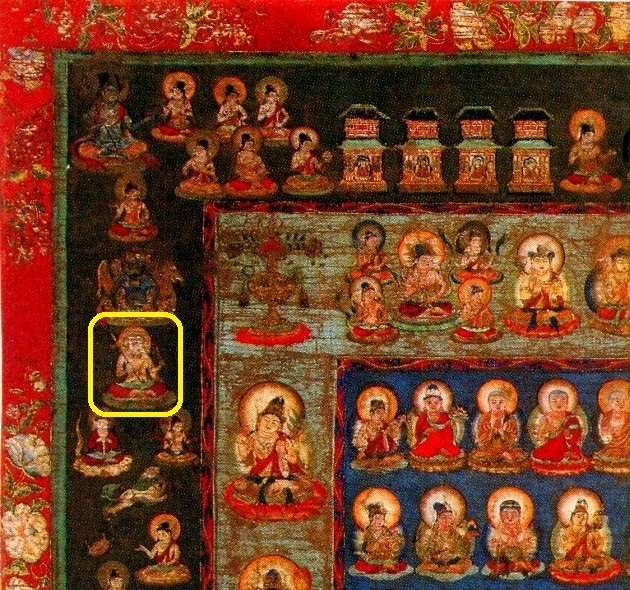 Vināyaka in at least one major Japanese esoteric manual is said to have been manipulated into becoming a Dharma Protector by Avalokiteśvara Bodhisattva. Avalokiteśvara manifested in a female form and said he could embrace her only if he would abide by Buddhist teachings and offer his protection. The underlying value behind this story is that it is permissible to manipulate the gods if it is to benefit Buddhism. Wrapping things up, Buddhism tends to favor revealed wisdom from wise human (Buddhist-affiliated) sources or, in the case of Mahāyāna, bodhisattvas and buddhas, while largely dismissing wisdom that might be gained from mundane gods. This approach to gods shapes the way Buddhist traditions interact with their host cultures: not denying the existence of the local gods, but at the same time relegating them to a lower status, even beneath flesh and blood Buddhist sages. This helps to explain the prevalence in Buddhist cultures for constant worship of high monks and other eminent practitioners. Even after they have died, their cremated remains continue to be venerated as a means of generating merit, yet hundreds-of-millions of years-old Brahmā is ignored because he’s ignorant and not noble in the Buddhist sense, so you get more merit out of worshiping the physical remains of a dead eminent monk than Brahmā. In other words, Buddhism has basically always placed a community of humans (almost entirely male) above their gods. This important point probably explains in part why in the post-Christian West, so many people are attracted to Buddhism: you are promised that you can achieve the same degree of wisdom as the Buddha without having to submit to any divine authorities (some even erase the gods from their religion and identify as Atheist Buddhists). Just as modern humanity attempts to conquer nature, so too does it seek to conquer the idea of divinity itself. Buddhism can be utilized to this end. I think one element you should take into account here, and which has largely been overlooked in literature on devas in Buddhism, is that in the Daśabhūmikā each of the bhūmis after the second are said to result in birth as rulers of the various deva lokas. So, for instance, a third bhūmi bodhisattva is born as Indra, a fourth bhūmi bodhisattva is born as the sovereign of Suyāma heaven, and so forth, up to the tenth bhūmi bodhisattvas, who are born as sovereigns of the Pure Abodes. Essentially, the major devas who appear in the Mahāyāna sūtras are conceived of here as bodhisattvas, which is of course precedented in the Saddharmapuṇḍarīkā by the claim that most devas can very well just be Avalokiteśvara's compassionate manifestation—which certainly makes one see that the instinct behind shinbutsu-shūgō is entirely consistent with what had been accepted doctrine in Mahāyāna Buddhism already going back to India. This also makes the claim that various tulkus have achieved certain bhūmis beyond the first somewhat unbelievable. Essentially, if you are born as a human and you are a bodhisattva, unless you are born as a cakravartin or manifest completely as a display (like a Buddha going through his twelve deeds), you essentially can only be a first level bodhisattva. A bodhisattva would not be reborn on earth in order to be taught by other deluded humans as part of their training, especially in a world which is undergoing the age of decline of Dharma. Bodhisattvas above the second level all are generally reborn as devas and receive their instruction directly from visions of the buddhas who manifest in the millions, trillions, etc. The Daśabhūmikā is worth a closer look. Do Buddhists Believe in a Flat Earth?